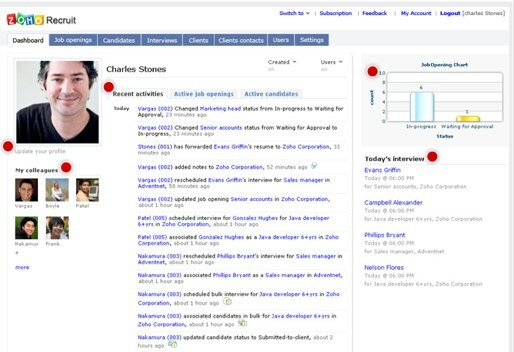 Web-based productivity suite Zoho is launching a new product today, Zoho Recruit. A niche product, Zoho Recruit, is an application designed to help HR Departments and staffing agencies management recruitment. Zoho Recruit, which is an offshoot of Zoho People’s recruitment technology, is an Applicant Tracking System that helps staffing agencies and recruiting departments track job openings, resumes, candidates and contacts. The application will source candidates by gathering resumes from multiple sources on the web and includes a technology that will weed out the candidates. The application will include a database that manages resumes and track potential candidates throughout the interviewing process. You can also schedule interviews, send automatic e-mail notifications and log candidate activities and notes. Zoho Recruit will also power a platform to create and publish job openings. The app includes an activity stream to let users stay on tops of new within Zoho Recruit and is fully customizable. Zoho Recruit is based on a freemium model, with the more feature-rich platform priced at $12/per user/per month.